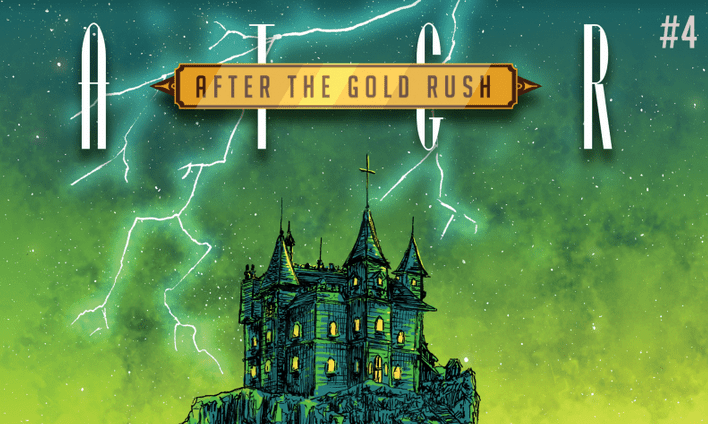 [EXCLUSIVE] Writer Miles Greb breaks down issue #4 of his heroic science comic, 'After the Gold Rush' – AiPT! What happens when humanity’s last scientist faces a world that’s slipped back into darkness — all but one person? In the comic series After the Gold Rush, writer Miles Greb offers hope for the future and proof that scientists can be heroes, through his protagonist Scout, a teen girl who’s returned from her home on Saturn’s moon, Titan, to find an Earth that’s abandoned the ways that enabled space flight to begin with. The final issue of the series’ first arc, #5, is fully funded on Kickstarter, but you can still get in on the fun until Monday. To whet your appetite, AiPT! Science presents the latest in our exclusive “director commentaries” with Greb, this time picking apart issue #4 and seeing there’s more to Scout than just botany and positivity. AiPT! : This is an interesting scene, with a character Scout is meeting for the first time. She almost seems insulted that he’d ask such a question. Is literature really that low-brow for her, as a scientist, or is she about to learn a lesson? Greb: This is a great question — Scout seems a little snotty here, almost, doesn’t she? One thing I think is important to understand is Scout is just 16, and she has been through a lot the last few days. She is feeling pretty defensive here, and was just trying to stand up for herself. She really doesn’t know what the stakes are or if actually she is being “attacked,” but she felt she needed to stand up for herself. Remember, just because Scout is the last scientist, doesn’t mean she is the supreme intellect or champion of all wisdom on Earth. She is just one person, who has the privilege of growing up in a culture that has centuries of scientific pursuit and knowledge as its foundation. She will make mistakes, and act “poorly” sometimes, as well. Oh, and Scout does read literature. Her favorite comic is The Extraordinary Adventures of Adèle Blanc-Sec, and a few books you have never heard of. She could do with reading a bit more, however …. AiPT! : There’s a lot going on in this one panel of the story the old man tells Scout. Do you think China will rival the U.S. in space exploration, going forward? Should we colonize the Moon and Mars? Is it a good thing for scientists to run for office? Greb: After the Gold Rush is not designed to be a prediction of future politics, simply a vision of it. In the story Gutenberg reads to Scout, you get to see that vision of the future. I wouldn’t want to make claims about how the future will be, I will leave that up to scam artists. Should we colonize Luna and Mars? Yes, we should. The technological, civic, and ethical concerns of doing so are complex and hard to overcome. However, I think they are all problems we can solve, unlike the problem of finite real estate on Earth. It’s good to grow, to reach out. It will be a dangerous chore for us, but as far as we can tell, nothing else in the universe is like us. Be it a result of our hubris, or actuality, I think it’s a good thing to protect and prolong our time in the cosmos. So we must reach out. Is it good for scientists to run for office? Well I think it’s easy for people like myself to give a resounding YES! However, I am also a person who believes expertise is real and important. What makes someone a great researcher, brilliant at math, or able to hypothesize new amazing ideas is one matter. What makes someone great at state craft is another. It’s kind of like making comic books, actually. It’s rare to be a great illustrator; it takes time and talent. It’s rare to be a great writer, for the same reasons. There are people who can do both, but that is inherently more rare. Therefore, someone being good at civics and science is rare. That being said, we need more evidence-based policy. I don’t know if more scientists running for office is the best way to do that, but I am willing to give it a try. AiPT! : “Rewilding” is kind of controversial, too. Or at least the idea of de-extinction is. But, almost like some kind of fable, one of [Earth’s] most capable and “higher” animals has betrayed it. We are harming the ecosystem; we all know this. The biodiversity of our homeworld is shrinking. So we can pursue a means to change that, or not. Right now you can argue it’s almost a novel trick to bring back a mammoth, for example. Maybe it is. I don’t know the best thing to “rewild.” I just know that the ability to do this will take years to master, and sometimes you need great “feats” of science to get the attention and funding you need to master the technique for more mundane and important tasks. I think we need to learn this power. AiPT! : Aha, here’s some literature that can teach Scout! Maybe about how people fear scientific progress? Greb: Indeed, here is a book. It will be interesting to see what Scout takes away from this story, no? Why do you think Gutenberg selected this book for her? Also, don’t forget it has two titles.